The big count-down is on, kids, and if you’re like me, you’ve still got gifts to make and cookies to bake. I was working on this relatively easy, unlined felt stocking today and thought I’d share this idea with you. 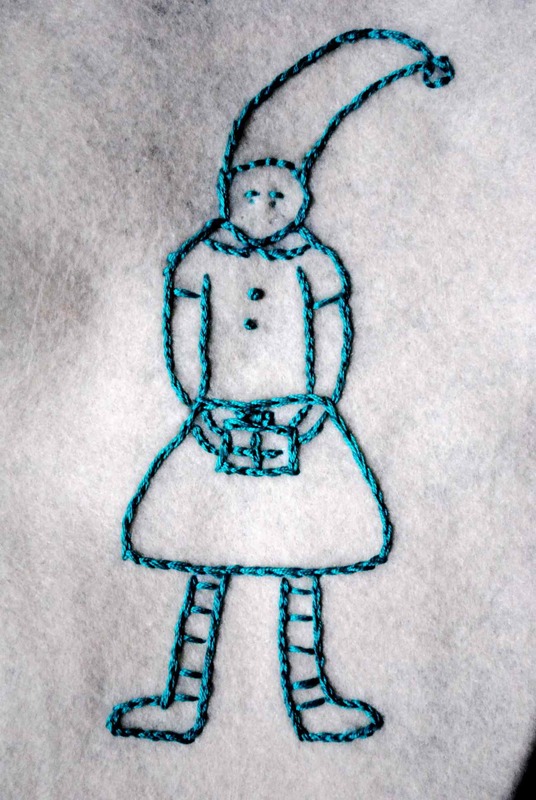 Depending on how fast you embroider and sew, this can be a very quick project. Vegan felt. 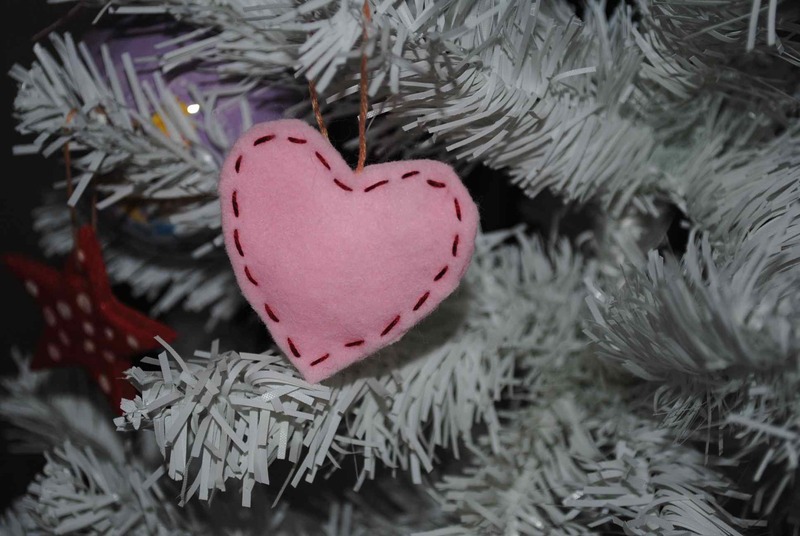 I used the vegan felt made from recycled plastic bottles I’ve blogged about before. Pencil or something to trace your pattern on. Christmas stocking to use as a model (if you don’t have a stocking at home, just free-hand it or google it, there are lots of them out there). 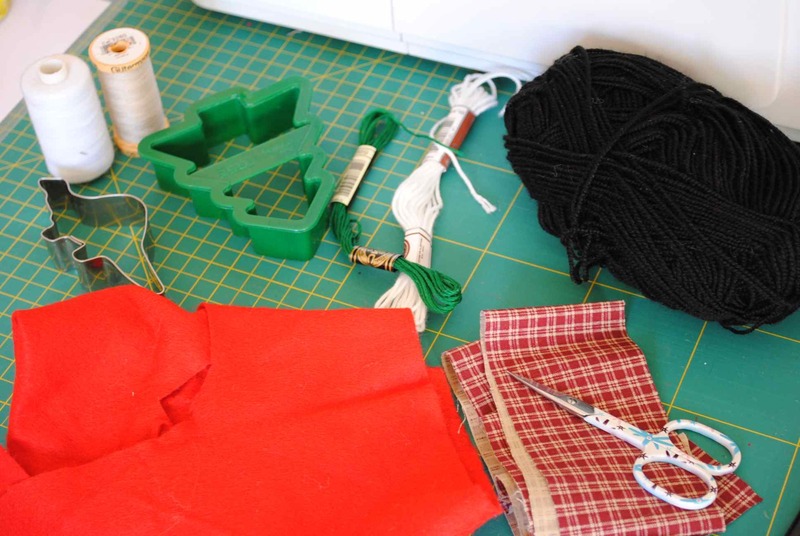 Scissors, thread and optional sewing machine (you can hand sew this quickly). 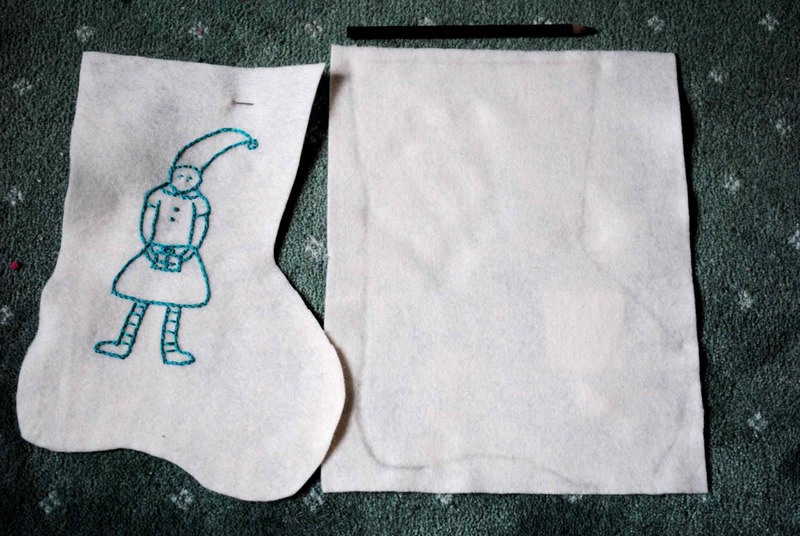 1) Start by tracing your stocking shape onto your felt. 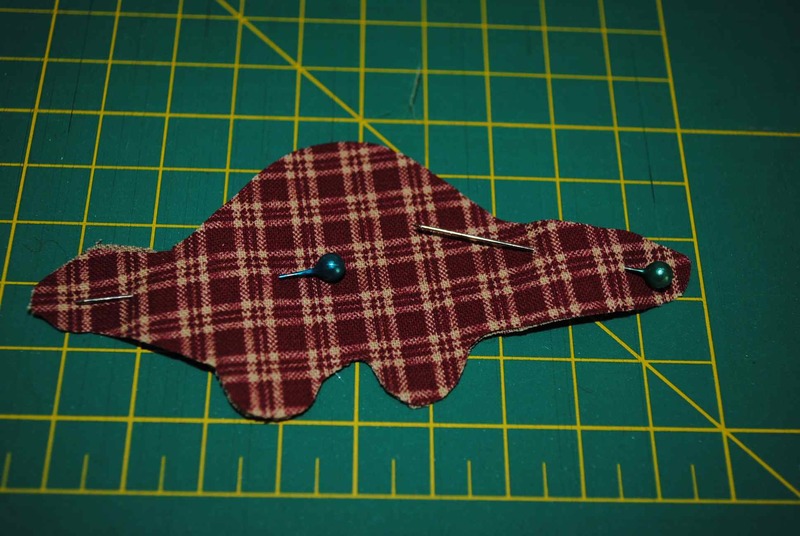 The quickest way to do it is to line up your two pieces of felt back to back, or fold a larger piece in two, then pin together. That way you’ll only be cutting once. 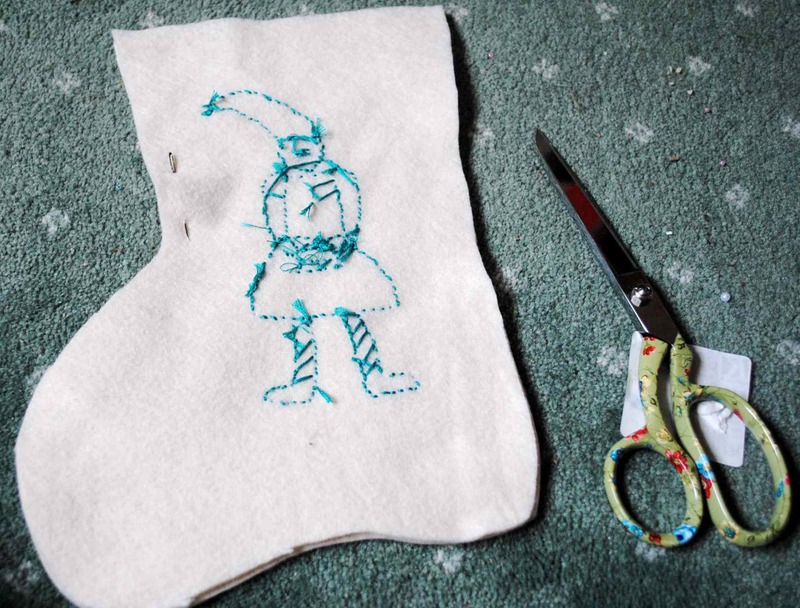 2) Once you’ve cut out your felt, you’ll want to draw a little something on it to embroider. 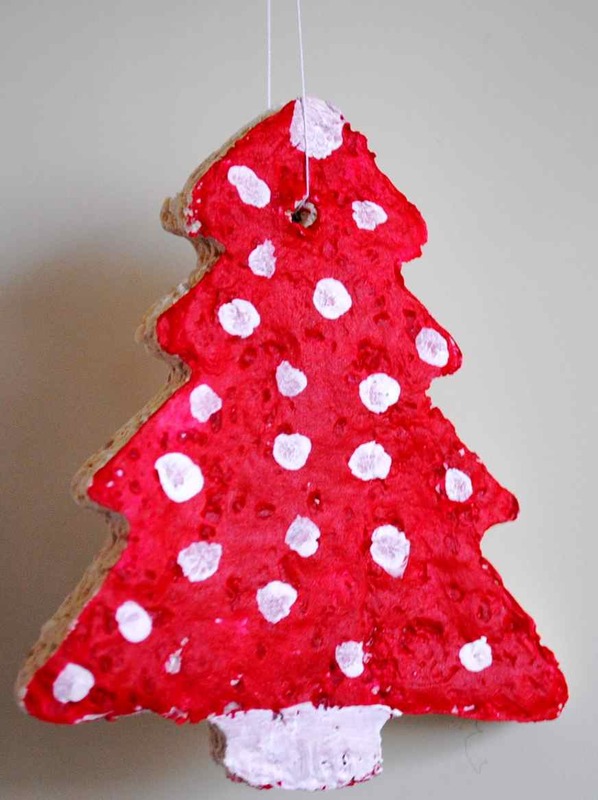 If you’re in a hurry (it is 3 days to Christmas) try to make your design rather simple. I just free-hand using a fat pencil. If this scares you (it did me the first time) practice a few times on a piece of paper first. I just free-handed this little elf girl, see the minimalist lines, etc. She’s not done, yet – I still need to give her a smile! Snowmen, Christmas trees, etc. work well here as they require few details yet still look lovely. 3) Embroider! Some people prefer sewing first, then doing the embroidery, but I find that because there isn’t much room to move inside the stocking it’s easier to embroider first, then sew. Look at the “How To” section at the top of the page for tutorials on basic embroidery, or again, google it. There are many helpful videos on YouTube, too. I just used a basic split-stitch for most of this little elf, but do what is easiest for you. 4) If the idea of embroidery scares you, just add a few appliqués. 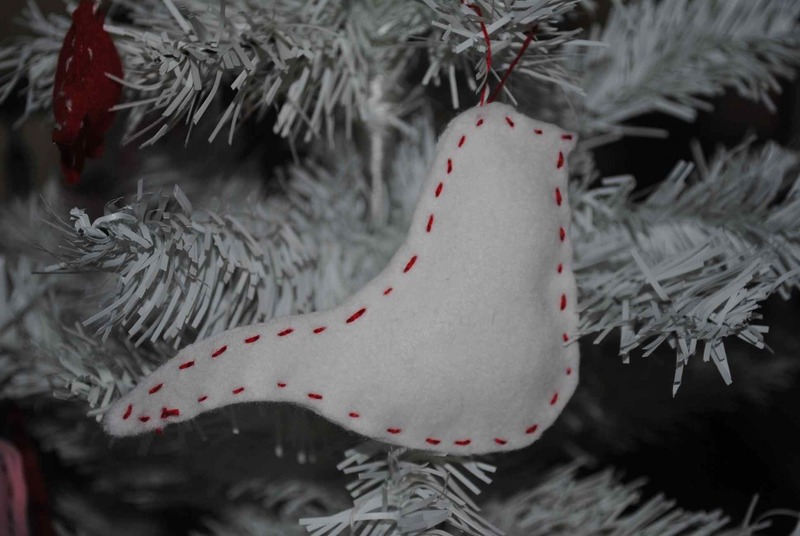 Follow the technique for the Basic Holiday Ornaments to get fun shapes, then handsew them onto your stocking – just be sure to allow for a seam allowance, or your adorable shapes will be swallowed by the seams! Aaak! 5) Fold over the opening of your two halves to finish them off and give them a nice, finished seam. The best is to fold over once, then fold over again so the raw edge is tucked up nicely. The amount is up to you, just be sure it’s not too bulky and that it’s the same on both halves. 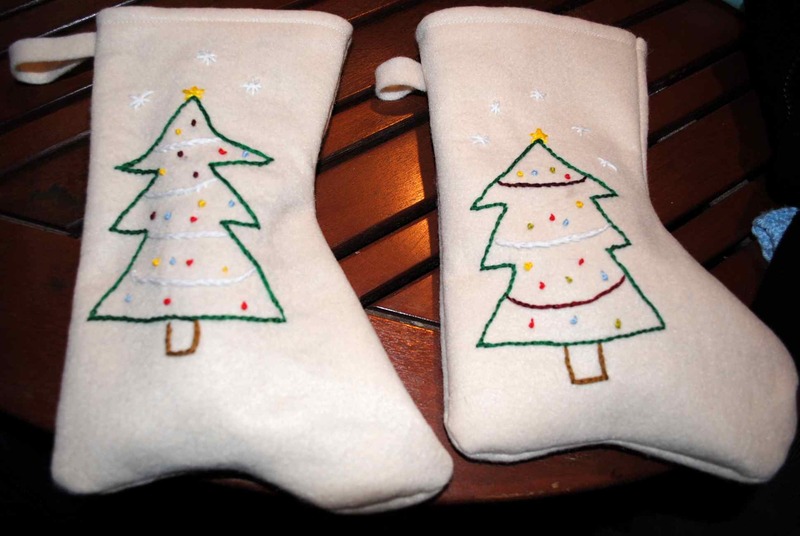 Sew them up with your machine (faster) or by hand (not terribly slow, if you’re only making one stocking). Now just sew along the edge, giving yourself about a 1/4 inch seam allowance, and turn inside out! You might also want to add a little bit of ribbon to the top for hanging, or embellish with ribbons, etc. Do you have any ideas for quick, last-minute gift ideas? Just remember, it’s ok. No matter what you’ve made or who you’ve made it for, it really is the thought that counts, no matter how trite that sounds. W.I.P. Wednesday will be back next year! It’s going to be an exciting year, and there will much going on. I can’t wait! 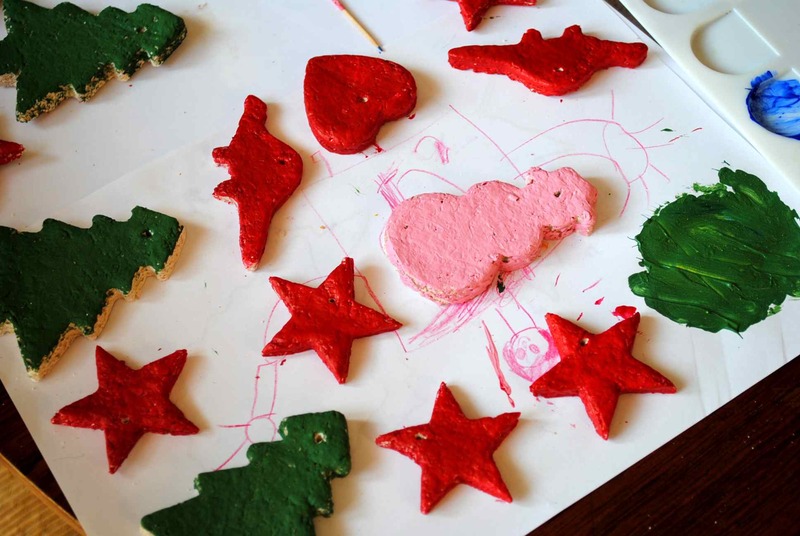 Making salt-dough decorations is a fun and inexpensive way to get festive with family or friends. It’s become a bit of a tradition, and every year we look forward to it. 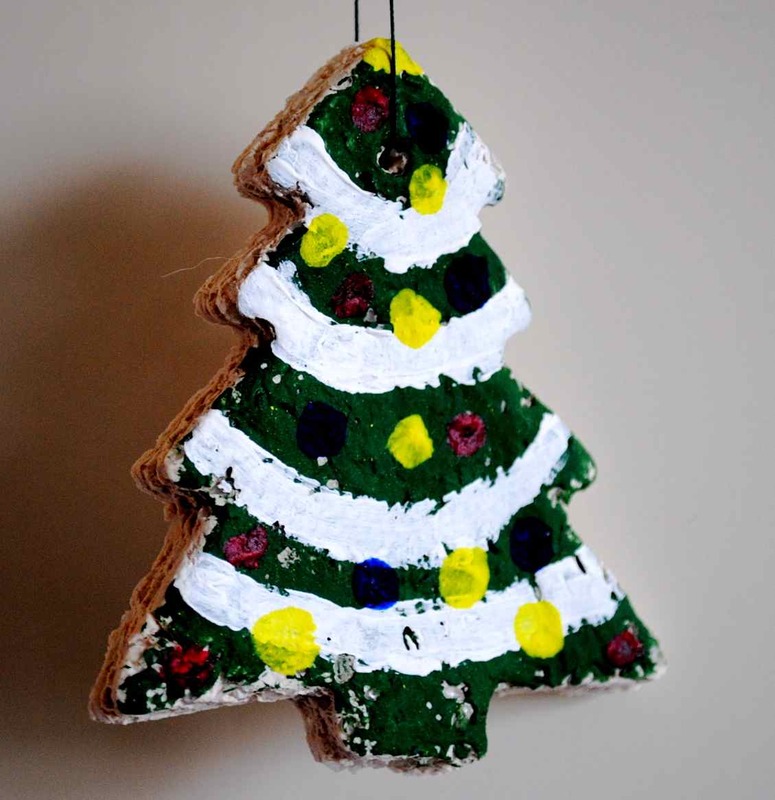 You might be wondering how we could be making these decorations for a third year in a row, but keep in mind : primo – We had almost no decorations when we first started; secondo – They don’t only hang on the tree! We’ve got decorations hanging around the windows, picture frames, even random nails that were left in the walls by our home’s former occupant. We don’t make a huge amount each time, and there is always some “spoilage”, ornaments that break from years past. All this blathering on, but not telling you why I’m blogging about them, again. Simply put, I’ve come up with a better formula that I find makes for more sturdy, beautiful ornaments. Additionally, I’ve got an improved drying technique that I think has allowed for thicker decorations, allowing for more fragile design reinforcement. Cookie cutters! If you’re thinking “I don’t have any cookie cutters, Shellyfish!”, just hold your horses. Bowls, juice glasses, etc. make wonderful circles, and I’ll bet your kids or nephews or sibs have some fun shape-making gear they use with their Play-Doesque toys. Look around, you’d be surprised what you’ll find with an open imagination. Libby, dinosaurs are wonderful here, too, obviously! Flour! This is not the time for your organic, whole wheat variety. Save that for your cookies. Use the cheap-o white bleached stuff, or get creative with buckwheat (pretty colour) or corneal (fun texture) and regualr flour combos. Salt! This year I got crazy and used large sea salt, mostly because I wanted to change-up the texture. I liked the results, but regular fine salt will give you a more classic, less rustic, look. Glycerine or heavy, neutral oil. If you have some glycerine, often used in home cosmetics, it’s the best choice, however, don’t get frowny-faced if you don’t. Heavy oils like apricot would work well, but regular vegetable will work in a pinch. See the lovely salt? You could add food coloring to the dough, and it would look lovely with the large bits of sea salt mixed in, I think. This project is best spread out over several days. 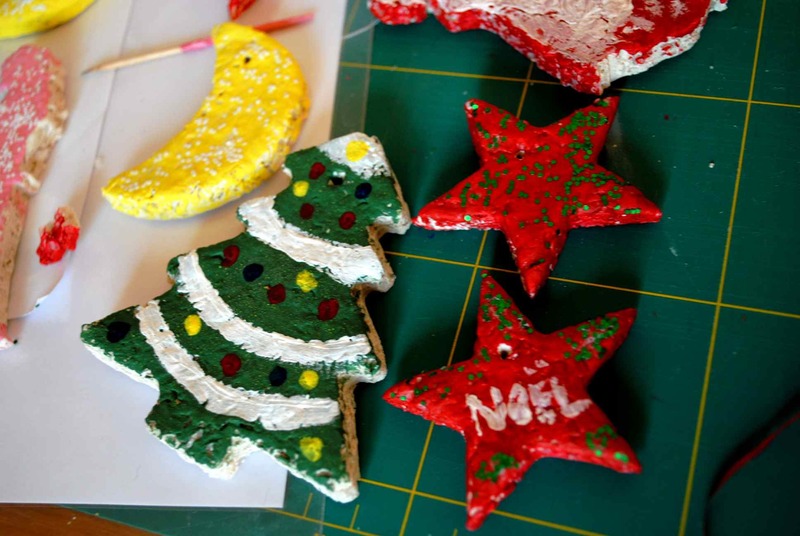 Your first day is making the dough and cutting out your shapes, the next few days will be for drying out the ornaments (depending on which technique you use, more on this below), then painting and drying, and finally an optional painting session for adding detail or a second coat of paint. This is important to keep in mind if you’ll be working with children. Depending on their ages (or temperaments) you could do the cutting and drying first, then allow them to paint, or break the project up into multiple days, which is what I did with Guppy. Mix the salt and flour in a bowl, then add the water, a little at a time until you get a smooth dough, not too sticky (add more flour if need be) and not too stiff (add more water). Add the glycerine and optional food colouring, and knead until it’s well blended and sleek and pretty. Now set aside, loosely covered, for about an hour. Now roll out your dough as if it were cookie dough (but don’t eat it, blek!) on a piece of parchment paper, or just form into objects if you’d like. Once you’ve rolled out your dough and cut out your shapes you’ll need to let them dry. It’s important to let them dry out really well before painting, because if they continue to dry once you’ve applied paint it could crack and not look as you’d hoped. Just keep in mind that the thicker your dough, the longer it will need to dry. 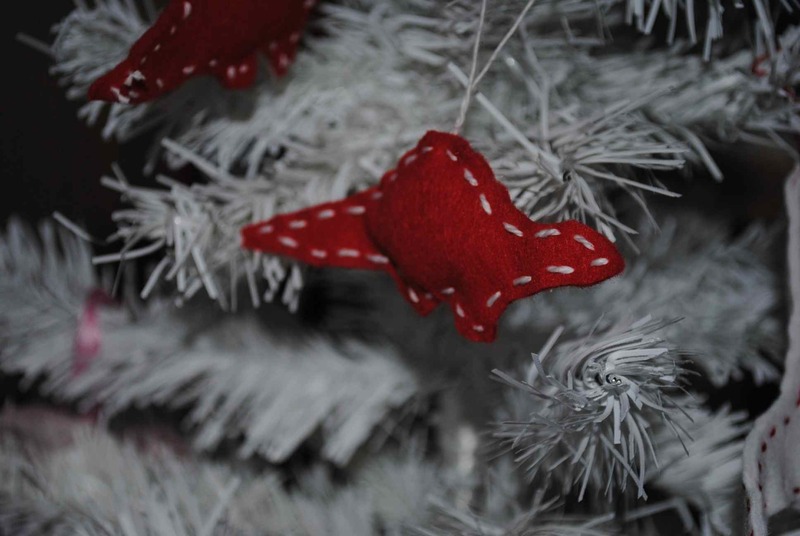 Please, before you begin drying your ornaments, be sure to remember to poke a small hole using a toothpick or knitting needle or whatever so that you can hang them up. Once they’re dry, it’s too late. Drying Method 1) Place your decorations on a radiator or furnace register and leave them there for a day or two (or in my case, leave them for about 4 days). I cut out the shapes while Guppy was sleeping and when she woke the next morning she declared “Mumma, you’ve decorated the radiators!”. See, you’re already decorating and they’ve not been painted yet! 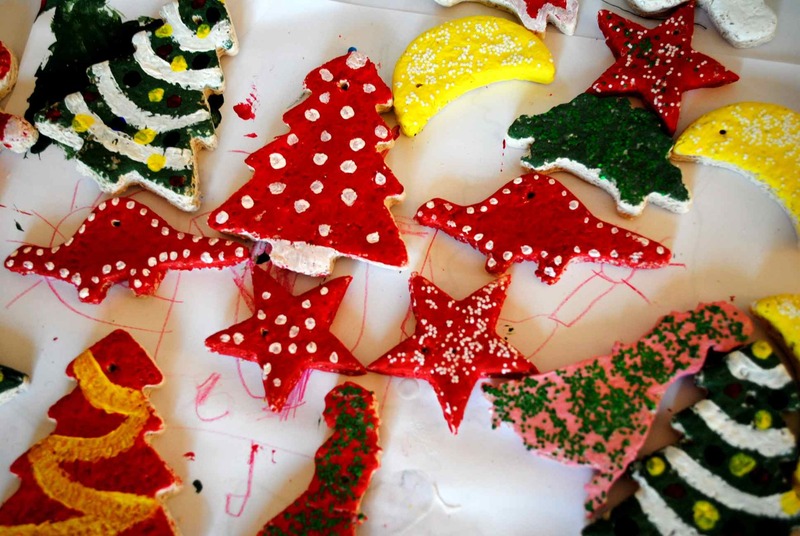 Drying Method 2) Bake your decorations on parchment paper-lined baking sheets at about 80°c/175°f for a few hours. You don’t want your oven hot, because it will cause the decorations to crack or bubble up – not good, unless that’s what you’re going for. Drying Method 3) This is the method I would recommend as it seems to work the best for us. Simply combine methods 1 and 2! I suggest starting by drying the decorations on the radiator or similar surface for at least 24 hours, then baking them. Just remember to have fun, no matter which technique you use! * A special danke to Mihl & P for sending us some really special cookie cutters. They made this year’s decoration creation session extra special! 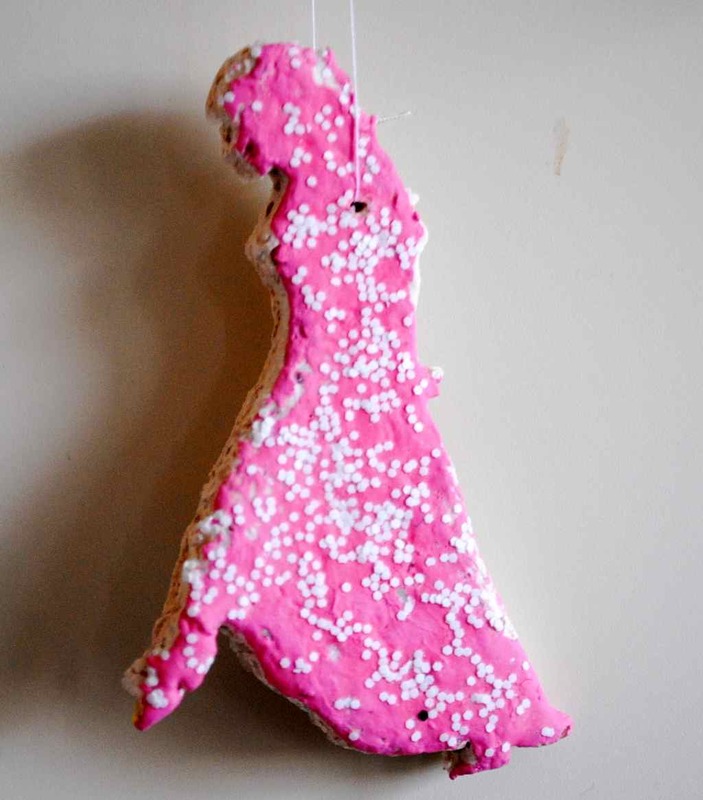 Last week I blogged about the famous “Cookie Cutter” ornaments I make every holiday season, and about how quick and easy they are to make. Then, after an email and a few comments it dawned on me that easy is a rather subjective word. For someone who has never tried to thread a needle or tried to sew (gasp!) for fun, well, not so much. 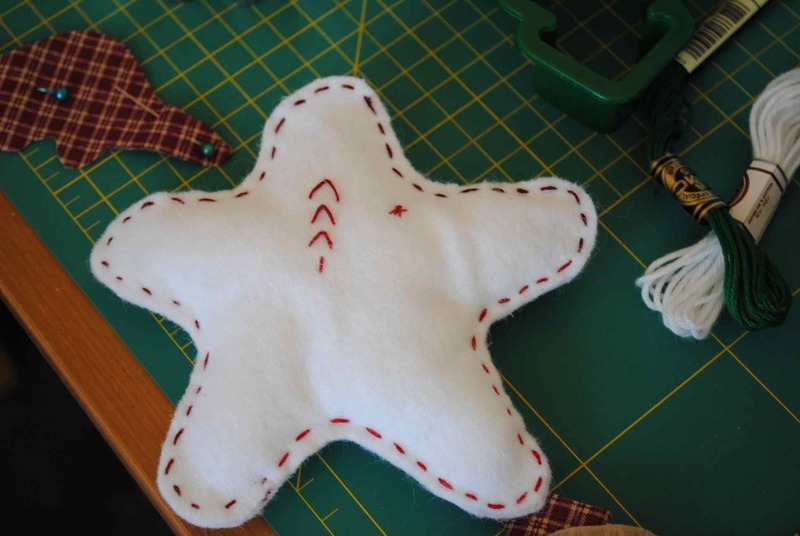 If you’ve got sewing experience then this post will probably bore you, but if you’ve got pointers or URLs with other more basic holiday projects to share in the comments section, please do. So let’s sew up an ornament together! It’ll be fun, promise. You’ll need a few basic things to get started, things you may already have around the house! Cookie cutters or other shapes you can trace as patterns, unless you’re going to free-hand your drawing, which is also fun, especially if working with little kids who love seeing their drawings “come to life”. Thread – So many choices! Cotton thread, or thicker, more durable craft thread, embroidery thread (you’ll want to use about 2 or 3 strands) or even some thin cotton yarn. I have also used very thin satin ribbon which is pretty, too. Fabric – Before you run out to buy some, or think you can’t give the project a go because you haven’t any, just stop. You can use nearly anything! 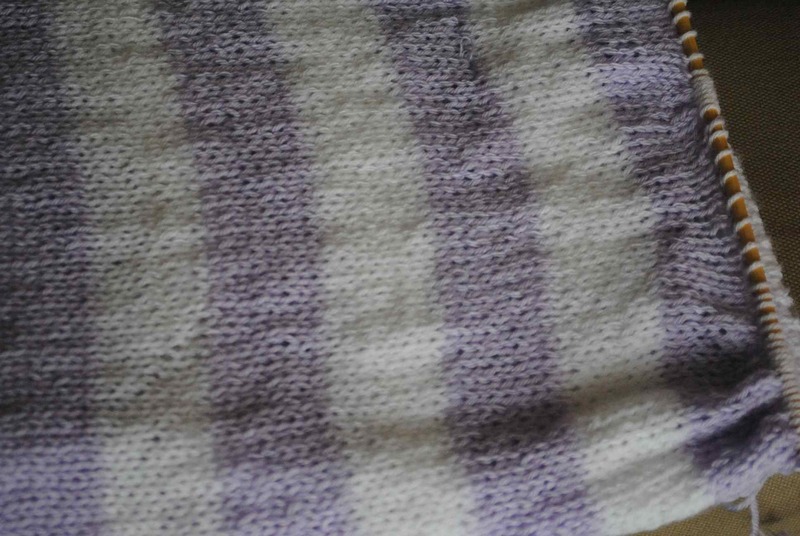 A re-purposed dish towel, the sleeve of a torn cotton shirt, bits from a stained table cloth, etc. You can also use heavier craft paper – it looks lovely sewn. 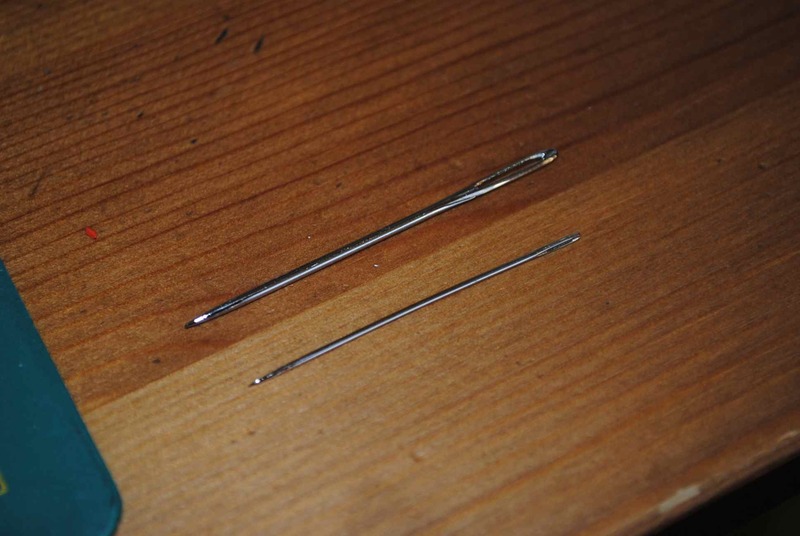 A needle for sewing and some pins to hold your fabric together. In a pinch you can use tape to keep the pieces together, and even paper clips. Get your fabric and fold it in half, with the right sides together. This just means that the side of the fabric you’d like to see once your decoration is done faces the inside for now. See what I mean? The red-checks are facing in and the boring backing is facing out. Perfect for drawing or tracing on. Because we make a few new decorations every year, they are like little snap-shots of the past. 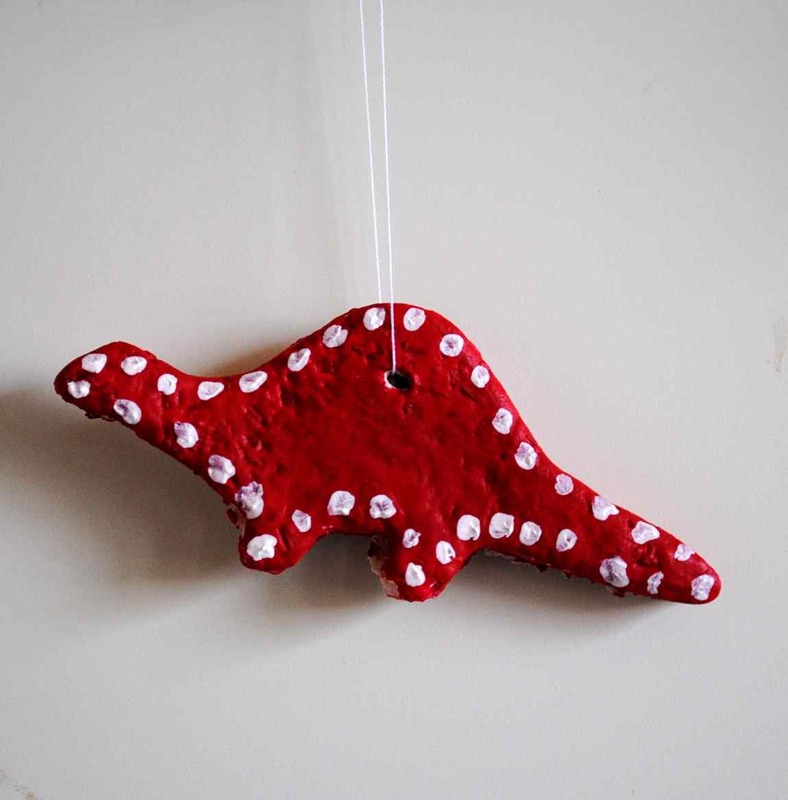 We love dinos, so we make a few each year. If your child (or husband) likes super heroes, try a cape with an S on it, or maybe an outline of a car. Don’t worry about it not being traditional! I still need to make a zombie for Monsieur Fish, because that’s what he loves, but haven’t got it worked out yet. 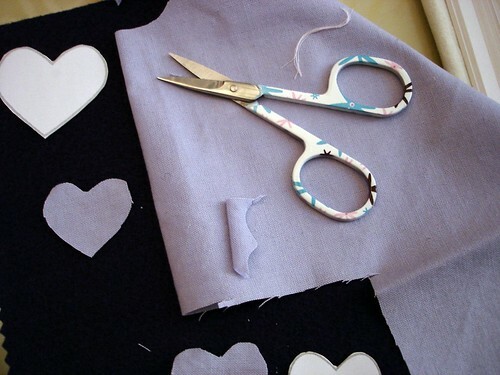 Once you’ve traced, pin the fabric together and cut it out, going through both layers of cloth. Notice how the top needle has a rather large eye and a blunt end? That’s an embroidery needle, so it can handle thicker threads, embroidery thread, yarn and ribbon. The tinner, sharper needle will work with cotton or nylon thread. Let’s thread your needle! You want to have a workable length of thread, not too long or it’ll get tangled up, too short, and you’ll be re-threading often. About from your hand to your elbow is a good size I think. 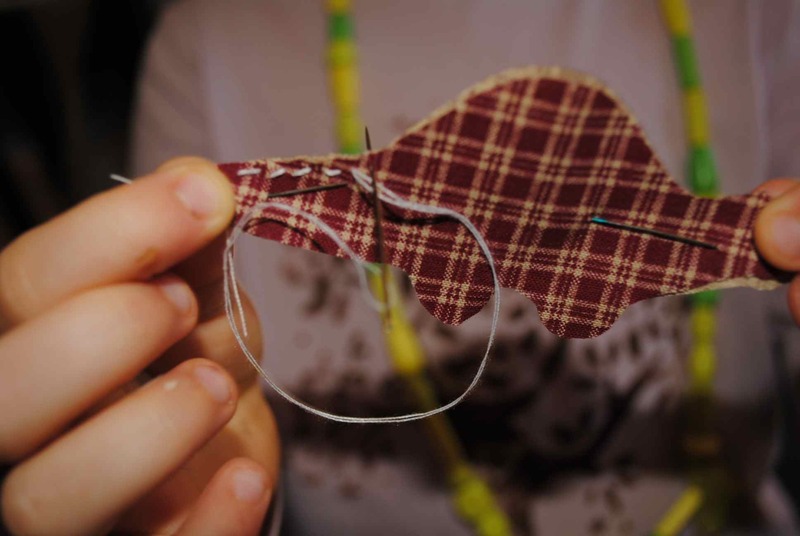 If you’re using regular cotton thread, just feed one end through the eye of the needle, then bring it to meet the other end so you’ve got a double-layer of thread (more sturdy). 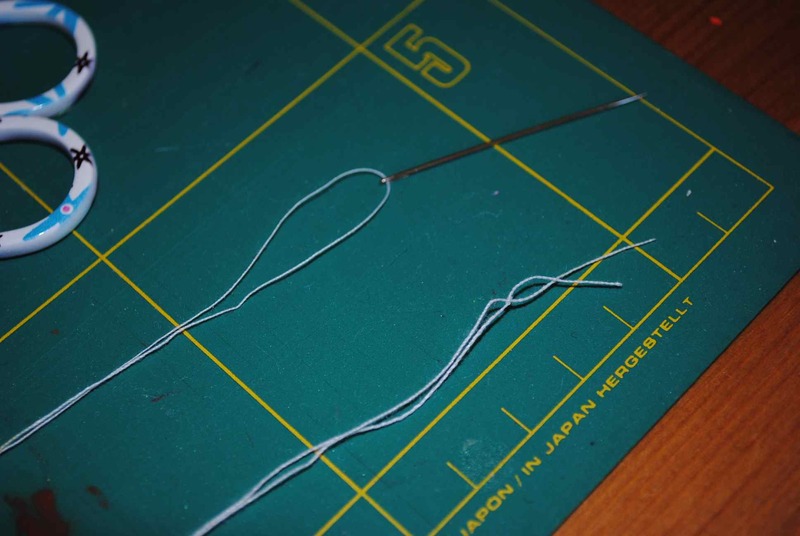 If using embroidery thread, take two or three strands, feed one end through the needle and pull to about half-way the total length, then knot the long end. It’s already sturdy enough so you don’t need to double up. 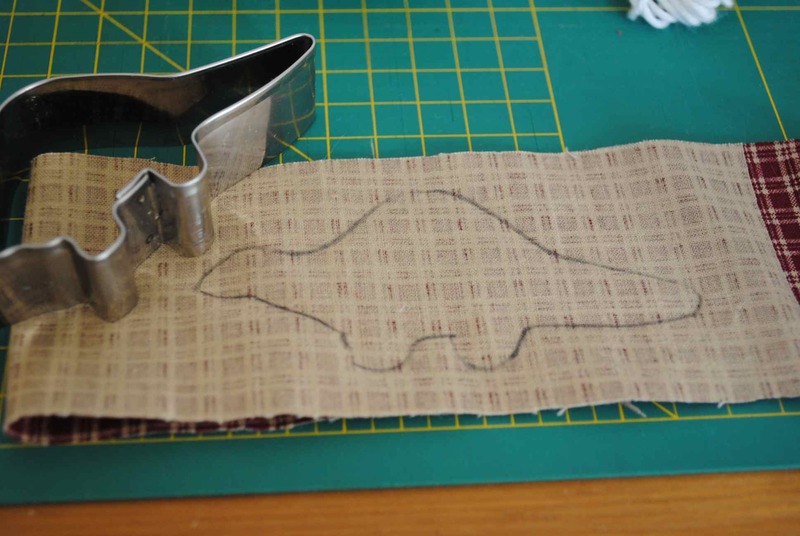 For your first stitch, you’ll begin going from the inside of your “sandwich” of fabric from the wrong side of one piece to its right side (meaning outside the dino here). 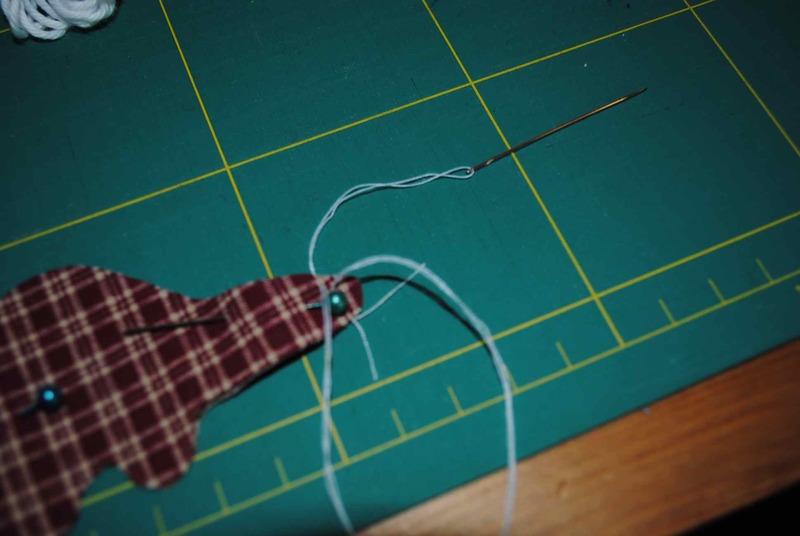 Gently pull until the knot is against the fabric, and tuck in or carefully trim any little tails that are left. 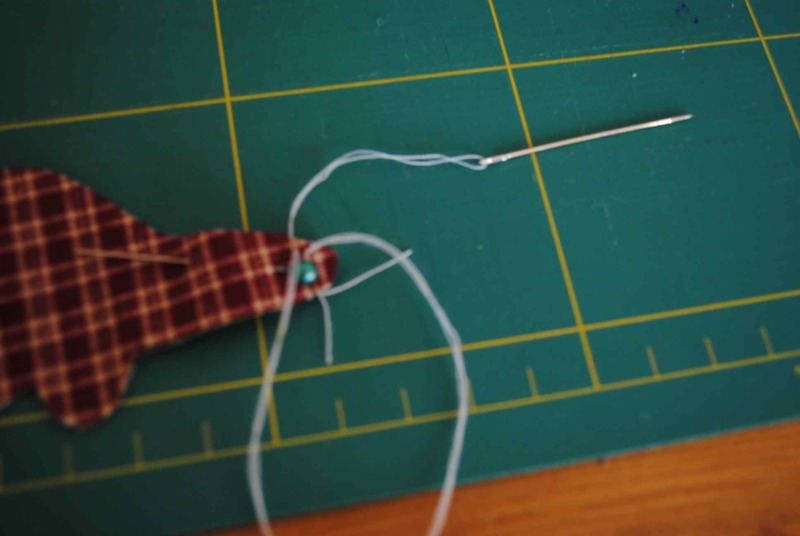 We’re going to do a straight stitch here, but to make things even easier, think of it as an in and out stitch. You just bring the needle through from one side to the other, all the way around your shape. Stop a bit before getting all the way around to stuff it if you’d like. 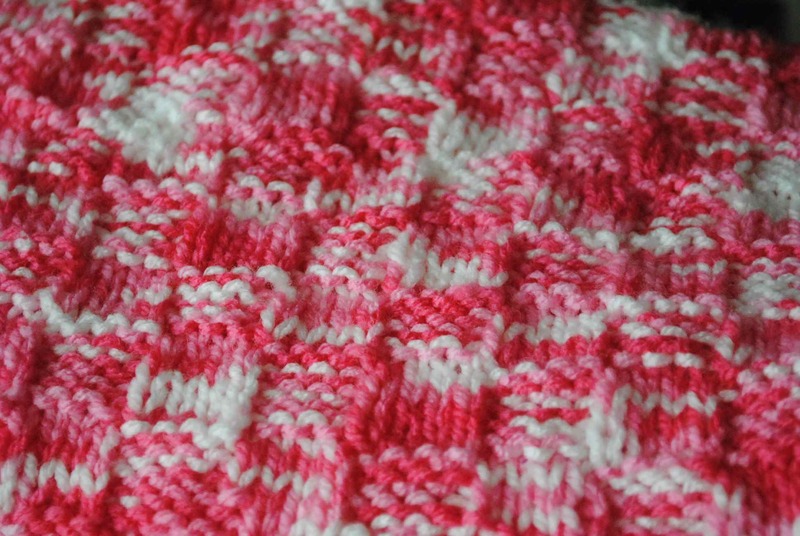 You can use scrap yarn and thread, or cotton or nylon batting. Then sew up the hole and tie a knot to secure. I hope this is helpful, and inspires you to make a few ornaments for your tree or window or potted plant or whatever. The tutorial for the Felt Doughnuts may also be helpful for you, too. 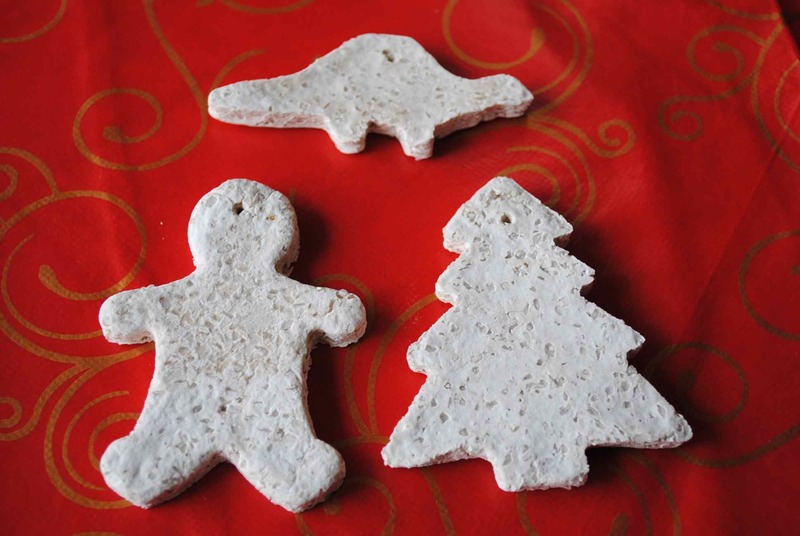 They also make cute decorations for you tree, Jeni Treehugger says so herself! W.I.P. Wednesday Vegan MoFo Edition : Bags, totes & sacs – oh my! It’s Vegan MoFo Day 17 (already! ), and it’s W.I.P. Wednesday, so rather than focusing on anything crafty I might be working on, I’m honoring Vegan MoFo by featuring some of my favourite Vegan Etsy peeps. When you make your purchases from Vegan Etsy sellers, you know you’re buying vegan, which is what we’re after. Today’s first featured Vegan Etsy vendor is Vegancraftastic. So many cute things it’s crazy! I’m partial to her bags, but she’s got much more than that. 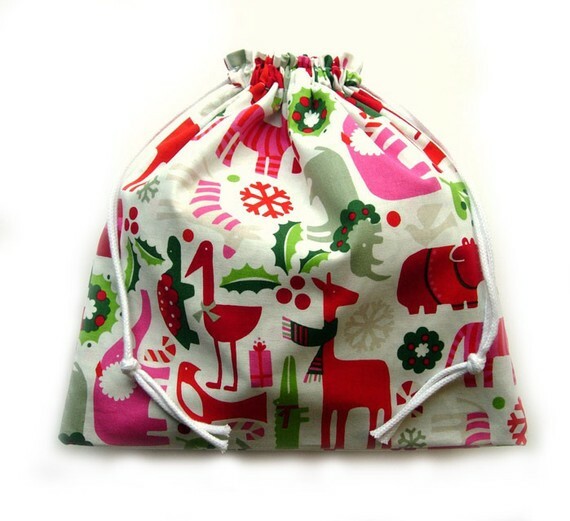 I think this Wild Kingdom Christmas bag would be great for keeping my holiday knitting project W.I.P.s, don’t you? 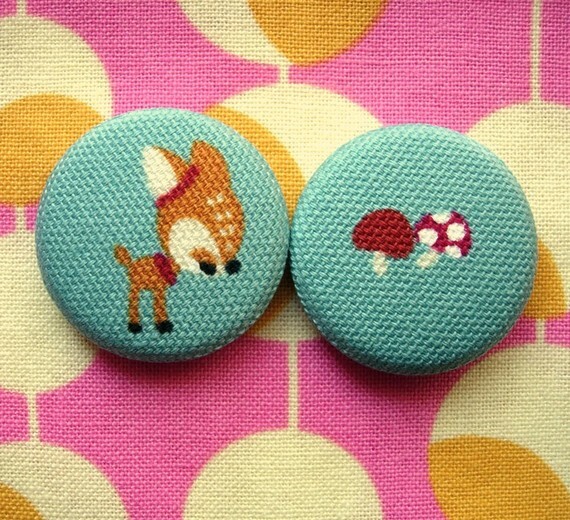 I know, it’s not a bag – but this woodland dear pin set is so sweet. She’s got lots of adorable pins and I want them all! This next crafting vegan queen needs no introduction to most of you, after all she is the craft maker to the stars! Kittee’s blog is a hoot, and her recipes keep my tummy happy, but dude! Check out her Etsy Shop! Personally I’m in love with these Holly Hobby Goes Goth bags. Holly Hobby can bring me next time she goes goth, just sayin’. While you’re there, pick up a copy of Papa Tofu, because you know you want to! AltheaFae’s shop is our last stop today, and believe me, you’ll want to go visit! This bag is so delicious I want to eat it right up! This Ooak Freeform crochet embellished bag is going on my Christmas list, fo sho! Just beautiful. And what about this cute little purse? It’s just the right size for a night on the town..or a quick run to the store to buy some flour to make delicious vegan cookies! AltheaFae is mighty talented, and her work has a lovely feeling of whimsy. Who is your favourite Vegan Etsy artist? Please share! Don’t forget to enter to win some yummy tea! Drawing closes tomorrow. In honor of Vegan MoFo, our regularly scheduled W.I.P. Wednesday posts will focus on some of my favourite Vegan Etsy artists and vendors. If you’d like to know a little more about the wonderful Vegan Etsy team and all they do, be sure and check out their blog, ok? Please do! Will you be purchasing gifts for friends and family this holiday season,? Be sure you give a look-see at the beautiful creations by the Vegan Etsy Team on Etsy. You can visit the Vegan Etsy Team Marketplace for a lovely showcase of their member shops, or do a “veganetsy team” search. Use your hard earned money on vegan-friendly gifts made by vegans! I would just love to send my friends and family these gratitude notecards by Jodi and Dan of Thisisit Creations. The use only eco-friendly materials and create the most lovely stationary, notebooks and other beautiful things. You must go see their Dachshund Spiral Notebook because it’s the cutest thing ever. Santa, you could put that in my stocking, non? This is the cutest freaking little turtle I’ve ever seen! I mean, he’s wearing a Christmas hat for pete’s sake! Who is responsible for such adorability? ChirpCards, that’s who! And just who is ChirpCards you ask? Why it’s my sweet friend and blogger Amy of Tahinitoo! This multi-talented gal makes more than just beautiful Hazelnut Shortbread, she is a genuine artiste. You can even buy a 5-Card Set so you could send a sweet, hand-crafted card to 5 of your favourite friends (or 4 of them, and me). Those vegans! They don’t kill animals, but they are killing me with cute! Feel like a cutie-attack? Go visit the My Zeotrope shop, but I’m warning you, you’re going to want to buy everything that Michelle has up for sale! You can visit her blog, too! Any cuter, and I would burst. And that would be messy. Be sure and tune in next W.I.P. Wednesday for more Vegan Etsy super-stars! And because this is W.I.P. Wednesday after all, go see fellow Wipster WindyCityVegan and her adorable daughter in the Owl Costume she made her for Halloween! The cuteness! After getting our Halloween decorations up earlier this week, Guppy was rather put out that she didn’t have anything to decorate her room with. Since most of the things we put up were rather fragile/not adapted for inevitable 5-year-old playing with it while no one is lookingness that will happen if they go in her room, I got thinking about “functional yet decorative” Halloween options. I think these may become part of a felty-moblile, but I’m still not sure. Either way, I’m having fun making them (so easy) and Guppy is having a blast helping me (glueing googly eyes is the bomb, apparently). 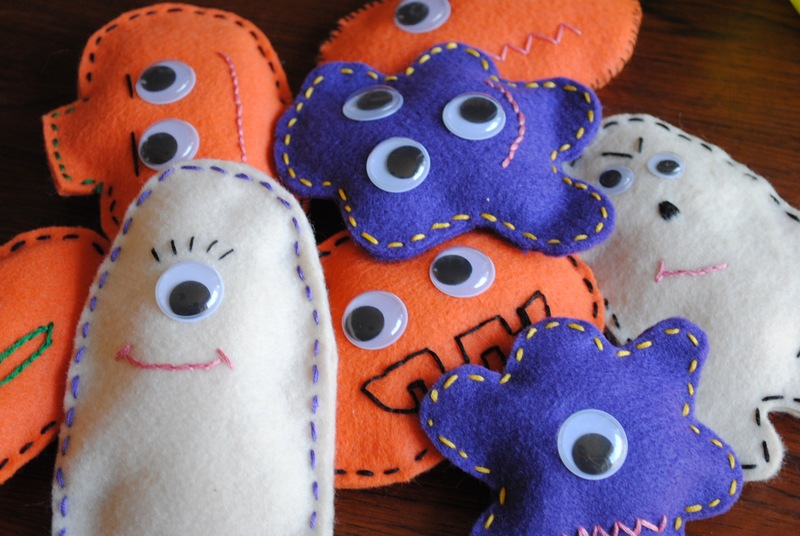 They are also “functional” because she’s having fun just playing with them – sorting by number of eyes, scariness, etc. I’m feeling frustrated that I am out of black felt, because I really want to make me some Witchies. Thinking about that one. What spooky (or, cute!) 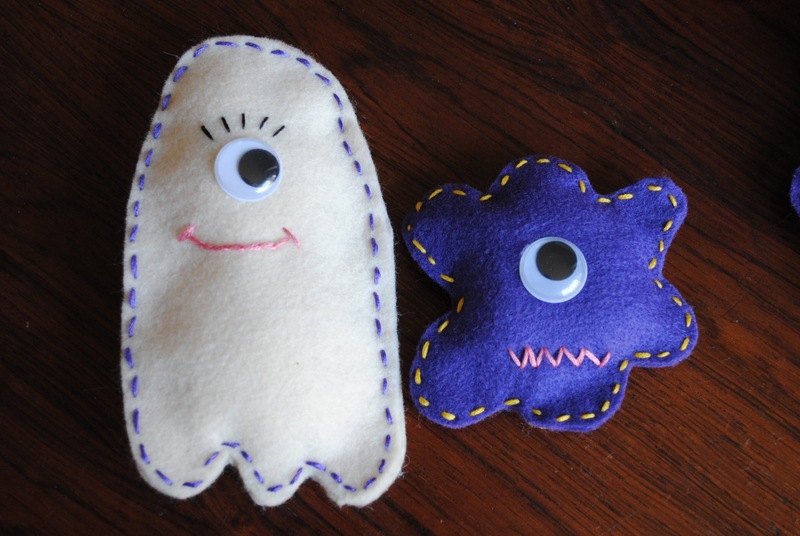 Halloween-inspired crafts are you working on? Do share! A day late, but not short on crafty ideas in this week’s installment of W.I.P. Wednesday. I can’t believe Easter is just around the corner. At our house Easter is celebrated as marking the Spring Solstice and the promise of new life and new beginnings. Vegan chocolate a plenty in the baskets, and usually some bunny love for our daughter, Guppy. This year I’m much busier with work that I have been in years past, but I don’t want that to get in the way of my making something special for the baskets this year. Last year’s bunny is still one of her favourites, and I’ve since made a few for other people. She also still plays with these bunnies from two years ago, one of my first attempts at sewing anything, especially a toy. 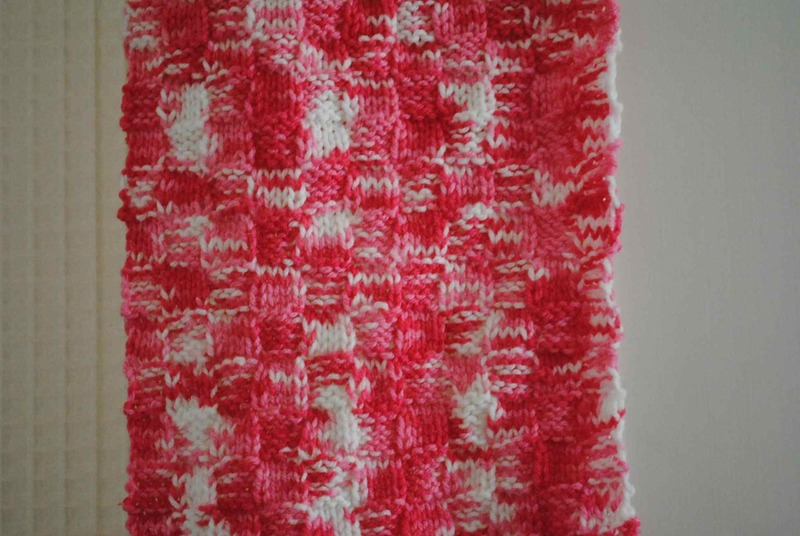 Inspiration abounds on the Internet, and these projects featured on The Purl Bee have really caught my attention. I’m not sure which I’ll have time to put together, but I thought I’d share my “Project To-Do” list with you. 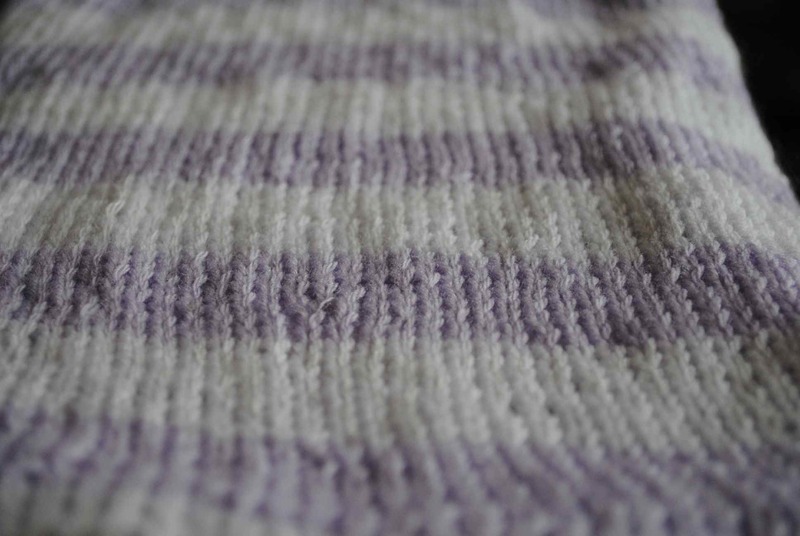 The following photos are all from the The Purl Bee site, and they’ll lead you to the project posts. These Bunny Finger Puppets are just adorable! I love that they’re quick and small, just like a bunny I guess. I’ve still got some vegan felt left, so I’ve no excuses. These Best Bunnies would be just perfect for my 1.5 year-old niece. With its reversible/double face, it’s like having two bunnies in one. This would be a great project to use up bits from other sewing ventures as well. Start here with Materials and Notes if you’d like to make one, and follow the links to complete your bunny. Have you got any Easter projects you’d like to share? Ideas are always more than welcome, just leave a link in the comments section. We would love to see what you’re up to! Snap a shot of your “in progress” masterpiece and add it to the W.I.P. Wednesday Flickr Pool. Whatever your works-in-progress, have a crafty week, and don’t forget to see what the other Wipsters are working on. W.I.P. Wednesday : Something with hearts. Summer holidays, how I love thee! I fully admit to being MIA from the blogosphere, but it’s for such a good reason : Sunshine! After nearly 9 months of rain we’re finally drying out and enjoying a beautiful sun. In fact, there have only been a few rainy days since the beginning of summer holidays two weeks ago. I have been keeping up with my favourite blogs, but please don’t be sadfaced if you’ve not been receiving comments as per my usual – I’m just trying my best to be a full-time mostly-on-vacation mum to one very energetic 4 year-old who would so enjoy having a back garden to play in! As some of you know, we live in a tiny flat in the city, so from the moment Guppy is fed and dressed we pretty much head out the door for the park or the forest or the castle grounds…taking advantage of some real quality time together since school is (mostly) out for both of us. You may remember I gave you a sneak peak at the gifts I was working on for Guppy’s teachers. Well, let’s just say that I wasn’t getting the embroidery done fast enough and I found myself the day before the last day of school with the gifts not completed. 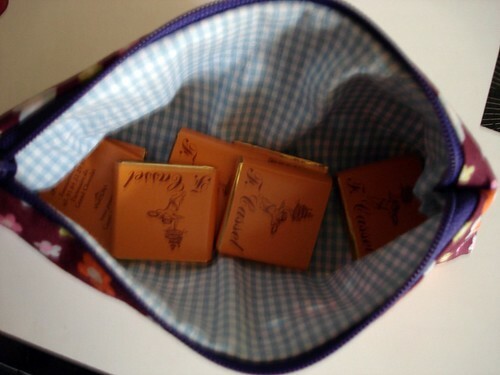 I then made an executive decision to change plans and just make two cute little pencil-case sized pouches and fill them with vegan chocolate. I asked Guppy how she felt about this and her only reply was, “Make something with hearts.”. Ok, fair enough. Because I don’t have any fabric with hearts on it I had to go with the appliqué method, which looked really cute I think. 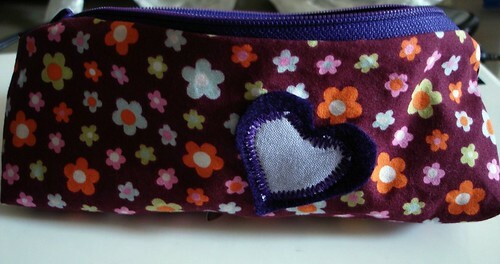 I just cut out two hearts per trousse – one larger in purple vegan felt, the other in lavender cotton. I hope they liked them. Or at least the chocolate in them! Don’t you love the wonderful blurry hurry-up-take-the-picture-we’re-late-for-school picture quality? You know you do! It’s like a crazy-crafting action movie I tell you. Are you crafting away, despite the beautiful sunshine and warm temps? Whatever your works-in-progress, have a crafty week, and don’t forget to see what the other Wipsters are up to, and to check out our W.I.P. Wednesday Flickr Pool, too.